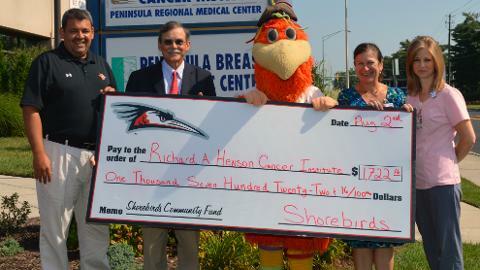 Salisbury, MD - On August 2, 2013, the Delmarva Shorebirds delivered a generous donation to the Peninsula Regional Medical Center Foundation to go towards the Richard A. Henson Cancer Institute at PRMC. The Shorebirds hosted Pink Pitch Night at Arthur W. Perdue Stadium this season and auctioned off game worn jerseys to raise money for the Henson Cancer Institute. In the above picture are (from left) Shorebirds Assistant General Manager Jimmy Sweet; Thomas DeMarco, MD, Medical Director, Richard A. Henson Cancer Institute; Sherman the Shorebird; Joan Daugherty, RN, MS, Executive Director, Richard A. Henson Cancer Institute; and Tina Collier, Supervisor of the PRMC Breast Center. For information about the Shorebirds community efforts, contact Shawn Schoolcraft at 410-219-3112.